Litecoin price is trading higher and broke the $135 resistance against the US Dollar. 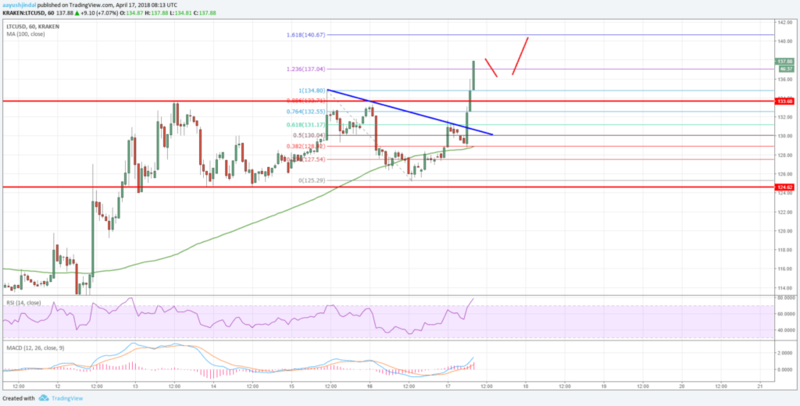 LTC/USD is gaining bullish momentum and it is heading towards the $140 level. Litecoin price started a fresh upside wave and broke the last high at $135 (Data feed of Kraken) against the US Dollar. There was a break above a key bearish trend line with resistance at $130 on the hourly chart of the LTC/USD pair. The pair is likely to accelerate higher towards the $140 and $145 resistance levels. There was a major bottom formed at $125 in litecoin price against the US dollar. The LTC/USD pair started a fresh upside wave and traded above the $130 and $132 resistance levels. It opened the doors for more gains and the price moved above the $135 high. More importantly, there was a break above a key bearish trend line with resistance at $130 on the hourly chart of the LTC/USD pair. The price is now trading well above the $130 level and the 100 hourly simple moving average. It is gaining pace above the 1.236 fib extension of the last decline from the $134.80 high to $125.29 low. It seems like the price may continue to move higher towards the $140 and $150 levels. A crucial barrier for buyers is near $140 since it is the 1.618 fib extension of the last decline from the $134.80 high to $125.29 low. If the price corrects lower from the current levels, it may find support near the broken resistance at $135. Moreover, the $130 level is a strong support, followed by the 100 hourly SMA. In the short term, the price is likely to accelerate higher above $135, and downsides could be limited. The technical structure is positive and suggests that the recent upside break above $135 was important. In the medium term, it seems like a decent support base is forming above the $120 level in litecoin price.